Global Event Tech 2016, a free to attend event which will take place on the 27th & 28th June from 10:00 - 16.00 across both days at Exhibition Centre Liverpool. Showcasing 42 of the leading event tech providers worldwide as well we have attracted high profile keynote speakers who will share their live event experiences, industry knowledge and expertise. Liverpool continues to increase its momentum to become one of Europe’s leading destinations for large scale exhibitions, ensuring it to be the perfect location for Global Event Tech to grow. Our aim is to provide both an innovative and thrilling platform for learning, sharing and developing new business as part of the International Festival of Business. 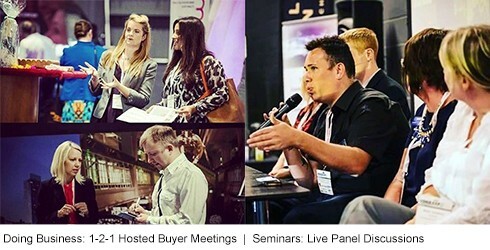 Global Event Tech is set to connect the events industry with a vast array of suppliers and events professionals. You can find the leading event tech providers such as ITM Mobile, D2i Systems and Glisser only to name a few, who will showcase the very best in the industry from latest emerging technologies and developments. The audience will range from event organisers from all backgrounds such as corporate or agencies as well as venues of whom are looking to enhance their own event experiences. We will be attracting international delegates by delivering a strong Hosted Buyer Programme by organising dedicated 1-2-1 meetings based on the Hosted Buyer's requirements and preferences. In return this will provide our exhibitors with outstanding business opportunities by connecting with the right people. At Global Event Tech, we believe that much there better place around the word to do business but in the heart of Liverpool. Any facts, figures or references stated here are made by the author & don't reflect the endorsement of iU at all times unless otherwise drafted by official staff at iU. This article was first published here on 18th May 2016.